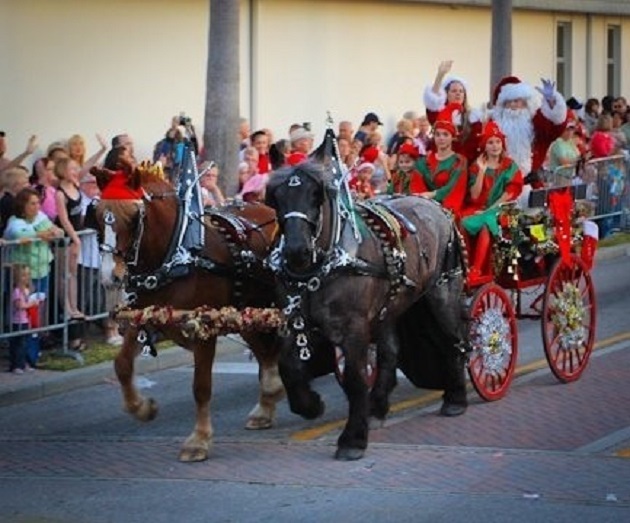 Meet Santa Claus, ride in a horse-drawn carriage, and experience snow flurries in Florida as the City of Dunedin hosts their annual Old Fashioned Christmas & Holiday Parade Saturday, December 9th, in downtown Dunedin. The event kicks off at 4 p.m. with the holiday parade, sponsored by the Dunedin Youth Guild. You can line streets from the corner of Douglas Avenue and Beltrees Street near Florida Auto Exchange Stadium, home of the Dunedin Blue Jays, all the way to Main Street. Watch the flakes fly, get candy from local businesses, and see Santa Claus make his way through town before Christmas. If you'd like to be a part of the parade, just fill out the application. The City of Dunedin Pipe Band will also bring some Scottish culture to the parade perform during the parade. So if you want some bagpipes with your Santa, this is the place to be next Saturday. Once the parade is over, explore the many shops and restaurants on Main Street like Kelly's - Chic a Boom - Blur, Strachan's Ice Cream & Desserts, Dunedin, Tony's Pizzeria & Ristorante | Dunedin, and The Black Pearl Restaurant. Before the sun sets, take the short walk to the marina to watch the sun set. Then head back up Main Street and finish off the night by checking out the vendors offering food and drinks as you walk around under the Christmas and holiday lights. Take some time out of your busy holiday schedule to become a kid again and enjoy everything about the holidays. Become less of a Grinch and more of a Cindy Lou Who. There will be train rides, snow slides, kids' crafts, old-fashioned games, live music, and entertainment throughout the evening. It's free to attend and the fun goes until 9 p.m. Bring the entire family and get ready for Christmas -- there's something for everyone at the Old Fashioned Christmas & Holiday Parade. Don't end up on the naughty list! Check out more things to do in St. Petersburg, Dunedin, and Clearwater. Looking for the best resource for Events, Restaurants and more? Stay connected to all things St. Pete by registering above. Your subscription is free!